Glamour and glitter will arrive at the Hawthorn Arts Centre when The Glitter and Doom Salon takes over the historic venue for one night only. Performer, broadcaster, writer and composer Jennifer Kingwell will take to the stage on Friday 5 May along with a stunning line up of acts. For The Glitter and Doom Salon Jennifer will be joined on stage by a handpicked cast of the finest cabaret, burlesque and comedy artists. Bewitching performers will include the biting wit of multi-award winning internationally acclaimed cabaret femme fatale Anya Anastasia, and performer and activist Mama Alto, a gender transcendent diva, cabaret artiste and jazz singer. Audiences can also look forward to rock comedy trashbag, Geraldine Quinn, who’s black humour has local and international sell-out audiences in stitches, as well as Brendan Maclean, a “king of pop in the making,” (The Guardian UK). Blues will meet burlesque with Kelly Ann Doll and Miss Bettie Bombshell when they take to the stage alongside Jennifer, to impress the audience with a live performance like no other. Inspired by the title of Grammy Award winning, Rock and Roll Hall of Fame inducted, American singer-songwriter Tom Waits’ last live album, The Glitter and Doom Salon delves into the essence of cabaret artistry: the interplay of glamour and tragedy. The show will combine the opulence of glamorous cabaret with the atmosphere of a dive bar and the surreal carnival-esque world of Tom Waits for an extraordinary live performance not to be missed. Jennifer Kingwell, a ‘dark, dazzling, formidable powerhouse’ (Herald Sun) heads up the Salon with her experience as a classically trained pianist with a background in electronic music and interactive multimedia. 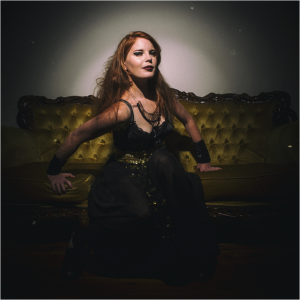 Jennifer is a performer of delicious contrasts who thrives on versatility, crafting epic and luscious piano ballads combined with evocative songwriting and spirited vocals. Her performances bring together performance art and music, blurring the distinction between the two for an exciting show that stimulates both the eyes and ears. Jennifer is a seasoned presenter; The Glitter and Doom Salon takes influence from her PBS radio show, now running for over five years. Be forewarned – the piano has been drinking, indeed. The Glitter and Doom Salon is coming to Melbourne for one night only and promises to be an unmissable night. Experience Hawthorn Arts Centre as you’ve never seen it before; its stunning interior provides the perfect setting for Jennifer’s opulent cabaret to create a truly irresistible show.